Given the difficulty that many couple shave in capturing their love and explaining why they are perfect for each other, it is good to know that there are some images which instantly make people think of love and romance. The love heart is the perfect symbol of love and this is at the heart of the Hearts Galore wedding invitation. This may be a simple wedding invitation but it says exactly what many couples are looking to say, which means it is a rare thing, a wedding invitation that offers both style and functionality. The range of love hearts at the top of the invitation provides a warm focal point but further down the card, the important information and details are provided to the guest. The mixture of pink, red and white creates a soft image, making this an ideal invitation for couples that are looking for a warm and traditional style of wedding. 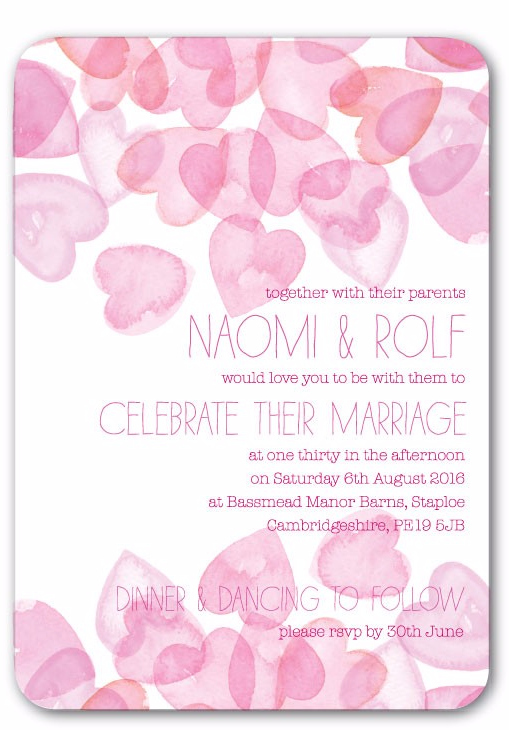 Love hearts will never go out of fashion when it comes to romance and weddings, and this style of invitation is always going to be a popular choice. The choice of font is modern and relaxed, bringing to mind a wide number of rom-com films where despite adversity and challenges, the couple get together in the end. This is exactly the sort of feeling that couples want to encourage surrounding their big day, and any bride and groom that feels the journey to their big day has been an entertaining one with a few twists will find that this is the perfect way to share the love for their big day. The Hearts Galore wedding invitation range is available with a vast selection of stationery so no matter how much correspondence you have, you’ll be able to communicate in an effective and stylish manner. Order from Ivy & Ellen.